The Phoenix Fuel Masters’ winning streak ends at five. In the battle between the top two teams in the league, the Rain or Shine Elasto Painters eked out a 98-94 OT win. The Elasto Painters move to the top of the standings with their sixth win in seven games while the Fuel Masters fall to second with their first loss of the season. Just like they’ve done all season long, the Elasto Painters relied on a balanced scoring attack. With nearly everyone on the roster contributing, Rain or Shine was able to take a sizeable lead in the first half. Maverick Ahanmisi, Raymond Almazan, Beau Belga and Rey Nambatac all scored to increase a two-point lead up to seven, midway through the second period. The lead stayed at that level until back-to-back hits by Nambatac and Kris Rosales from the outside to take a nine-point lead. Rain or Shine was able to build a double-digit lead in the third quarter. After Phoenix tied the game at 56 midway through the third, the Elasto Painters went on a 14-0 blast to reclaim the lead. Almazan and Rosales played crucial roles during that stretch as they knocked down several baskets to power the scoring spree. The Elasto Painters held on to a nine-point lead heading into the final period. In danger of losing the game, Phoenix fought back in the final period. They chipped away at the deficit behind the efforts of Calvin Abueva and Jason Perkins. They pulled to within five points with 1:39 left in the game. Perkins scored on a jumper and Matthew Wright nailed a three-pointer to cut the lead down to just two. Perkins then scored on a floater inside to tie the count at 87 with 13 seconds left. James Yap missed the potential game-winner, sending the game to OT. In the extra period, the Elasto Painters got a scoring boost from Mark Borboran. After Nambatac and Almazan raised the lead up to four, Wright scored on a layup to keep the door open for Phoenix. But Borboran scored on a basket inside to secure the big win for Rain or Shine. 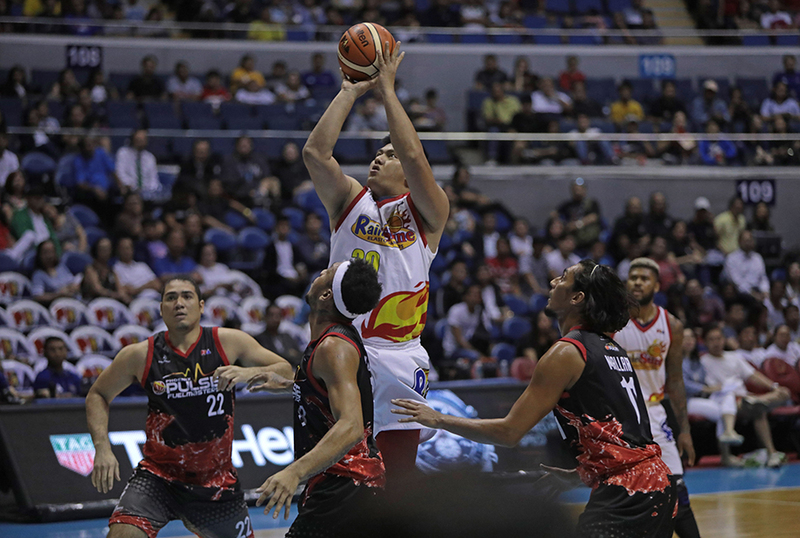 Beau Belga and Rosales led the Elasto Painters with 16 points each. Belga also had nine rebounds and seven assists. Ahanmisi added 13 points from off the bench. Perkins led the Fuel Masters with 27 points. 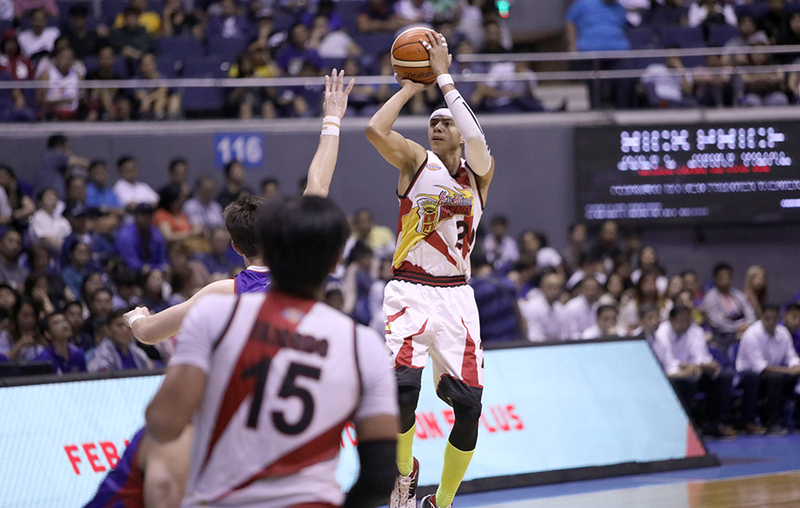 In the second game, the San Miguel Beermen dominated the Philippine Cup Finals rematch against the Magnolia Hotshots. The Beermen took over the game early and continued to pour it on to win, 113-92. Arwind Santos returned from illness in to pump in 29 points on 7/11 shooting from beyond the arc. June Mar Fajardo added 22 points and eight rebounds while Terrence Romeo added 23 from off the bench. The Beermen started out the game on fire. Chris Ross opened the game with a three-pointer, followed by two outside shots from Santos. Fajardo scored inside to close out the 10-0 opening run. That blast set the tone for game. Fajardo and Santos continued to pour in the points in the first period to increase the lead at 16. San Miguel’s defense also limited the Hotshots to just four points in the first eight minutes of the game. The Beermen scored 28 first quarter points while limiting the Hotshots to just 12. Ian Sangalang led the Hotshots with 19 points. With the game slowly getting out of hand, the Hotshots buckled down and started to execute offensively. Paul Lee and Sangalang got their rhythm and led the comeback. They were able to cut the deficit down to just seven points before settling for a nine-point deficit heading into the half. The flood gates opened in the second half. The Beermen were able to rebuild their double digit lead in the third quarter. Romeo scored five straight points to power a 7-0 run and regain their 16-point lead. In the fourth period, Romeo, Santos and Fajardo all conspired to go on another 7-0 run to push the lead up to 19. They led by as much as 24 points in the final period to secure the win.